While The Conqueror’s Saga may be more of an alternate history rather than a true fantasy series, it is nevertheless based on a genuinely fascinating premise. Imagine if Vlad the Impaler, one of the most brutal figures in history, known for his cunning and penchant for cruelty and who served as the main source of inspiration for Dracula, was instead…a princess? As I wrote in my review for the first book, it’s this subversion of the archetypical YA heroine trope that initially drew me in, and I was looking forward to see how the author would continue this story. Now I Rise is a sequel that picks up shortly after the end of the first book, following Lada’s split with Radu and Mehmed in order to return to Wallachia. Our protagonist is determined to regain control of her country, which she knows she is destined to rule. Though she is without power or allies at this point, Lada is not about to let anything stop her, gathering whatever forces she can to harry the countryside and put the pressure on her enemies. Meanwhile, her brother Radu has been sent undercover to Constantinople by Mehmed, who has become Sultan of the Ottoman Empire. Once the object of Lada’s affections, Mehmed is now consumed by a new vision to retake the city from the Byzantines, driven by a prophecy that has foretold his rise. Radu, who harbors his own secret feelings for Mehmed, is unable to deny the Sultan anything and thus agrees to be his spy behind the walls of Constantinople. But as Radu carries out his mission for Mehmed, he cannot help but think of his sister Lada, who is far away fighting her own war for a throne. Ever since they were children, the siblings have always depended on each other, with Radu providing Lada with his wisdom and strategic advice while she shielded them both with her strength and confidence. But Radu also can’t help his heart, which cleaves him to the Ottomans’ mission. Torn in his love between the two most important people in his life, ultimately Radu will have to decide where his true loyalties lie. Reading this book, I was pleasantly surprised to see how unconventional the story felt compared to most other YA novels. It is in essence a retelling of the fall of Constantinople and the retaking of Wallachia—based very loosely on the true events. Thus in many ways, this novel read like a military fantasy, featuring a plot that concerned itself more with war campaigns and waging a siege. I think it would be fascinating too if you are familiar with some of the true history, watching Kiersten White combine fact with fiction to create something new and exciting. At first, I was also apprehensive about the fact that our three main characters—Lada, Radu, and Mehmed—are mostly split up in this book, and that the main story threads rarely crossed. Thankfully though, for all that the story featured little to no real interaction between them, it didn’t turn out to be much of problem at all. The distance between the characters actually gave each of them a chance to reflect on the ties that were already in place, and I also liked how this gave them the opportunity to form new relationships and motivations. In particular, I loved Lada’s perspective in this novel, and her struggle with her identity. While the world sees her as merely a woman, she knows in her heart she is a soldier, and woe to those who underestimate her. The ending was testament to this, and it was at once both difficult and satisfying to read. Then there was Radu, who just damn near broke my heart. I can see how many would find him exasperating and unlikeable, but somehow I can’t bring myself to hate this poor lost boy. It’s possible I may also be influenced by residual sympathies I had for him in the last book, in which he was my favorite character. The story was sensitive to the subject of his sexuality and I thought White’s writing captured his internal struggle very well. 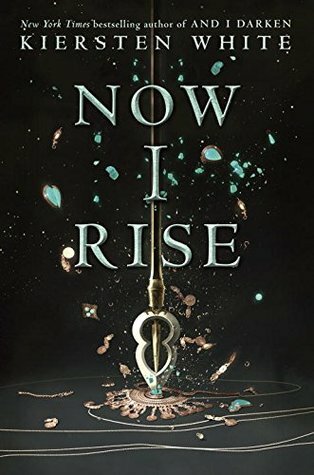 Now I Rise is, in a nutshell, a wonderful sequel that delivered on everything it promised, including lots of character growth and even more dark thrills in the plot. The execution of this series has been very impressive so far, as are the new directions the story has taken, and I find myself looking forward to the next book in the saga. Audiobook Comments: Fiona Hardingham is fast becoming one of my favorite audiobook narrators, and she was the main reason why I decided to switch formats and review the audio for the second book in The Conqueror’s Saga. As always, Ms. Hardingham delivers a fine performance, and I can find no major faults with her narration. If you’re considering the audiobook versions for this series, I would highly recommend it. Glad to see this one was so good. I think my library has an audio copy of number one so I shall have to grab a copy. Awesome! I love the narrator, and I’m pretty sure she read book one as well.